The Ink Trap: Guest Designer at Susana's Custom Art and Card Design! Guest Designer at Susana's Custom Art and Card Design! Hey, all! Guess what! I'm honored to be guest designing for Susana's Custom Art and Card Design (SCACD) this week! There are LOTS of terrific images and LOTS of fabulous tools and supplies to peruse, as well. Definitely check out the SCACD online shop, I insist. 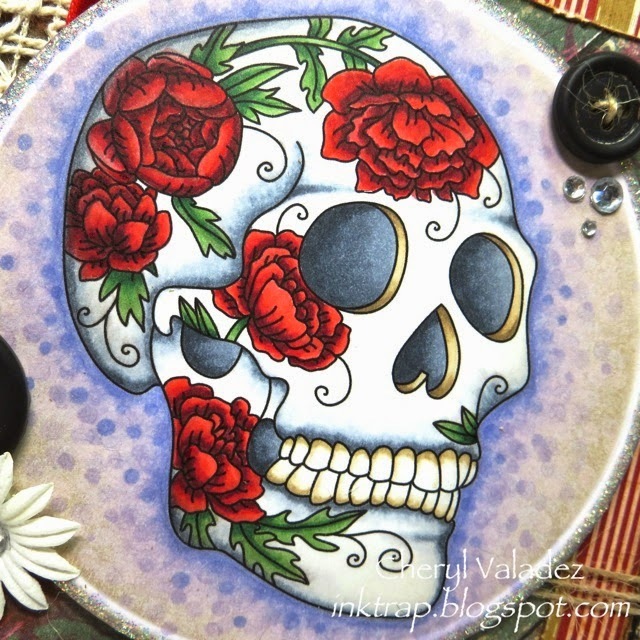 For my card, I'm using Sugar Floral Skull in a digi format, but this exquisite design is also available in rubber. I've colored him up with Copic markers and listed the colors above. Nothing fancy regarding the card construction, as I wanted the main focus to be on my image. I have to tell you, I have a soft spot for all things skully so this stamp really called out to me. Heck, you should see how I have my house decorated...LOL! Lots of Day of the Dead art! I thoroughly enjoyed playing with this SCACD image this week and will undoubtedly have more to show you later on. Also, don't forget to stop by the SCACD store blog. Their design team is fabulous and soo talented, you won't want to miss anything those wonderful ladies are cooking up over there. A beauty of a sugar skull! You colored this to perfection! Fabulous creation! What a lovely skull image, too. I love skulls. I love Sugar Skulls (especially bobble-headed ones). I love how you have your house decorated. 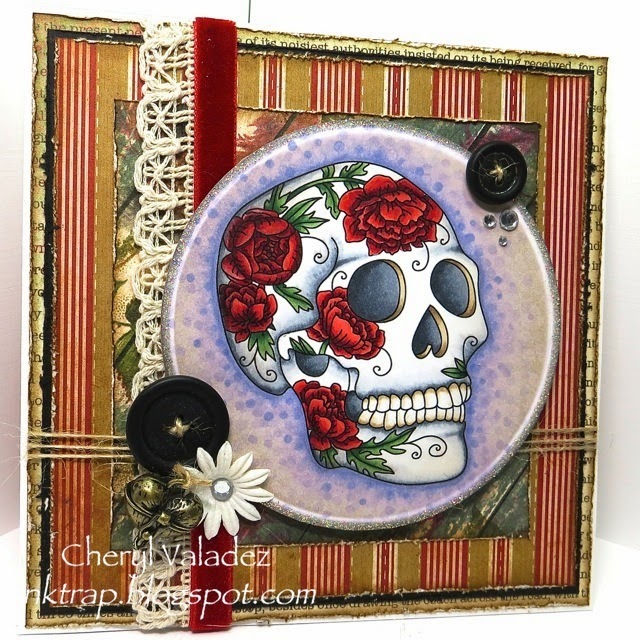 And I love, Love, LOVE what you've done with SCACD's Sugar Skull stamp! It's beautifully colored and the card design is absolutely fabulous too! This is wonderful, I love how you did the reds in this, especially with the velvet lace accent! Gorgeous! Love the way you combined the skull with the papers. The stripes and rich colors are the perfect accent to the beautiful coloring.